Light Brown Antique Ceramic Birdbath with 2 Birds. 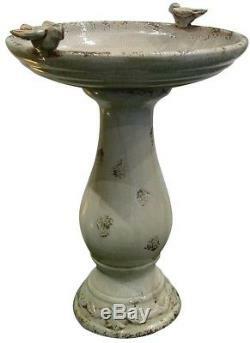 Welcome your feathered friends into your garden with this Red Antique Ceramic Birdbath. 2 detailed birds molded into the ceramic adorn the rim of the basin to create a more welcoming environment. Perfect for your garden or near your favorite gathering spot, this birdbath brings timeless beauty to your outdoor space. Light brown glaze with slightly weathered appearance creates a simple, rustic look. Water capacity offers plenty of water for birds of all sizes. Painted ceramic adds a distinguished touch to your yard or garden. Weather-resistant design is suitable for outdoor use in most climates. Bowl Diameter: 19 Product Depth in. Please do not hesitate to ask if more quantity is needed. The item "24 in Antique Ceramic Birdbath with 2 Birds Outdoor Basin Bird Bath Garden Statue" is in sale since Sunday, December 10, 2017. This item is in the category "Home & Garden\Yard, Garden & Outdoor Living\Bird & Wildlife Accessories\Birdbaths". The seller is "americanhomeimprovement" and is located in Multiple Locations. This item can be shipped to United States, Canada, United Kingdom, Denmark, Romania, Slovakia, Bulgaria, Czech republic, Finland, Hungary, Latvia, Lithuania, Malta, Estonia, Australia, Greece, Portugal, Cyprus, Slovenia, Japan, China, Sweden, South Korea, Indonesia, Taiwan, South africa, Thailand, Belgium, France, Hong Kong, Ireland, Netherlands, Poland, Spain, Italy, Germany, Austria, Israel, Mexico, New Zealand, Philippines, Singapore, Switzerland, Norway, Saudi arabia, Ukraine, United arab emirates, Qatar, Kuwait, Bahrain, Croatia, Malaysia, Brazil, Chile, Colombia, Costa rica, Dominican republic, Panama, Trinidad and tobago, Guatemala, El salvador, Honduras, Jamaica, Antigua and barbuda, Aruba, Belize, Dominica, Grenada, Saint kitts and nevis, Saint lucia, Montserrat, Turks and caicos islands, Barbados, Bangladesh, Bermuda, Brunei darussalam, Bolivia, Ecuador, Egypt, French guiana, Guernsey, Gibraltar, Guadeloupe, Iceland, Jersey, Jordan, Cambodia, Cayman islands, Liechtenstein, Sri lanka, Luxembourg, Monaco, Macao, Martinique, Maldives, Nicaragua, Oman, Peru, Pakistan, Paraguay, Reunion.